Bernardo Bellotto's style reveals a taste for what is charming and elegant. He specialized in metropolitan landscapes and historical architecture. Often using a technique called camera obscura in order to achieve the greater accuracy of his urban views. Bellotto lived during a time of political unrest and social upheaval. The old social order imposed by greedy monarchs and enforced by corrupt clergymen was buckling under freedom of the press and an intellectual movement called "The Enlightenment". People were becoming curious about modern science, art and philosophy. Venice, Bellotto's birth place, was an enchanting city of canals, art studios, vineyards, wine, rich cheeses, magnificent cathedrals and a breathtaking marina. The Rocco Era 'The Art of the Aristocracy', rocco is derived from "rocaille" (pebble), but the term referred in particular to the small stones and shells used to adorn the interiors of grottoes. Such shells or shell forms were the primary motifs in Rococo ornament. The Rococo style began as a backlash against Baroque formality and stuffiness. Unlike Baroque, Rococo is not concerned with religious matters or dramatic expression. The highly decorative art and design movement began in Paris, France in the early 1700s. The style is profoundly symbolic of the self-indulgence of European aristocratic rulers. Rocco manner is characterized by graceful, enchanting, lighthearted themes and seldom features anything of substance. Paintings are animated and clever, reflecting an impishly sensual daydream. Rocco paintings feature effeminate male aristocrats decked out in velvet, elegant laces, prancing about in high heels. Women are garishly painted sporting dusty, grey powdered wigs. The figures are tall and willowy, stylish and charming. The faces are presented as soft and rosy, effeminate and eternally young. Noblemen are depicted wearing feminine coiffeurs, rouged lips and cheeks, often sporting womanly attire. In a way they resemble modern day drag queens. The Rocco female figures are delicate and light; the faces, are childish and sentimental. The lines of the mouth curve in soft mischief or in a delicate enchanting smile. Characteristic of Rococo art was paintings of wealthy carefree aristocrats at play in make-believe settings. These romantic scenes depict luxuriously costumed ladies and gentlemen flirting, picnicking and playing music at gallant country parties. The background scenery is often a serene natural setting with delicate trees and sprays of roses. Colors are a profusion of soothing, light pastels. The Rococo movement was initially restricted to France, later spreading to all of Europe and above all to Germany. The movement continued to develop until the arrival of Neoclassicism which attempted to return to the purism of classical antiquity. Bernardo Bellotto, 1721-1780 was an Italian urban landscape painter or vedutista, and printmaker in etching famous for his vedute of European cities (Dresden, Vienna, Turin and Warsaw). He was the pupil and nephew of Canaletto and sometimes used the latter's illustrious name, signing himself as Bernardo Canaletto. In Germany and Poland, Bellotto called himself by his uncle's name, Canaletto. Bellotto's style was characterized by elaborate representation of architectural and natural vistas, and by the specific quality of each place's lighting. It is plausible that Bellotto, and other Venetian masters of vedute, may have used the camera obscura in order to achieve superior precision of urban views. 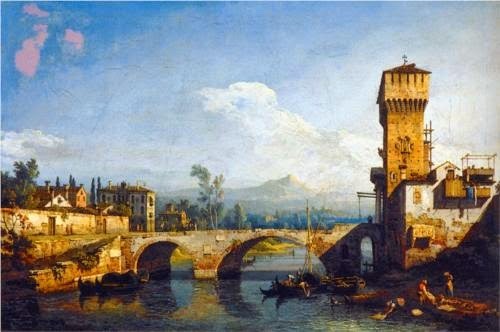 Bellotto was born in Venice, the son of Lorenzo Antonio Bellotto and Fiorenza Canal, sister of the famous Canaletto, and studied in his uncle's workshop. In 1742 he moved to Rome, where he produced vedute of that city. In 1744 and 1745 he traveled northern Italy, again depicting vedute of each city. Among others, he worked for Charles Emmanuel III of Savoy. From 1747 to 1758 he moved to Dresden, following an invitation from King August III of Poland. He created paintings of the cities Dresden and Pirna and their surroundings. Today these paintings preserve a memory of Dresden's former beauty, which was destroyed by bombing during World War II. His international reputation grew, and in 1758 he accepted an invitation from Empress Maria Theresa to come to Vienna, where he painted views of the city's monuments. Thereafter he worked in Munich and then again in Dresden. When King August III of Poland, also an Elector of Saxony, who usually lived in Dresden, died in 1763, Bellotto's work became less important in Dresden. As a consequence, he left Dresden to seek employment in St Petersburg at the court of Catherine II of Russia. On his way to St. Petersburg, however, Bellotto accepted an invitation in 1764 from Poland's newly elected King Stanisław August Poniatowski to become his court painter in Warsaw. Here he remained some 16 years, for the rest of his life, as court painter to the King, for whom he painted numerous views of the Polish capital and its environs for the Royal Castle in Warsaw, complement of the great historical paintings commissioned by Poniatowski from Marcello Bacciarelli. His paintings of Warsaw, later relocated to Moscow and Leningrad, were restored to the Polish Communist Government and were used in rebuilding the city after its near-complete destruction by German troops during World War II. Our Sponsors this month are Tesori Trovati and 5 Fish Designs. Please visit us tomorrow to see the prizes! • Please post at least one single shot of your creation in the Flickr pool. This will be used to make a collage for the Monthly Challenge Gallery. Every creation will be added to the collage, regardless of a blog post. So everyone gets included! • Be sure to share with us the name of the art bead artist in the description of your photo so that if you are selected for the weekly Perfect Pairings on Mondays, both you as the designer and the art bead artist can get the credit you both deserve! • The Monthly Challenge Recap with Blog Tour will be posted on May 30th. • One prize winner will be selected at random from all pictures posted on the Flickr pool. • Formerly the Featured Designer of the Week, our new Perfect Pairings will now focus on both the jewelry designer and the art bead artist. Be sure to point out all the art bead artists in your work in the description of the photo in the Flickr pool. Links to their website or shop are appreciated. That way we can all find new art beads to love! 1. Create something using an art bead that fits within our monthly theme. We post the art to be used as your inspiration to create. 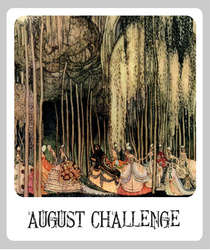 This challenge is open to jewelry-makers, fiber artists, collage artist, etc. The art bead can be created by you or someone else. The challenge is to inspire those who use art beads and to see all the different ways art beads can be incorporated into your handiwork. 2. Upload your photo to our flickr group. Detailed instructions can be found here and click here for a tutorial for sending your picture to the group. Please add the tag or title MAY ABS to your photos. Include a short description, who created the art beads and a link to your blog, if you have one. Deadline is May 31st. Photos are approved by our moderators, if a photo hasn't followed the guidelines it will not be approved. You may upload 2 photos a day. p.s. If you have a blog, post your entry and a link to the ABS challenge to spread the beady goodness.